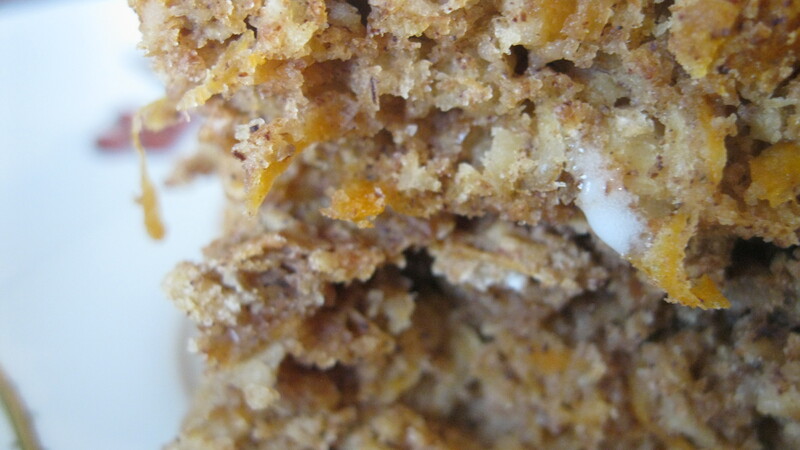 Spring is the perfect time for carrot cake. In fact, I can’t really think of any time of year, any time of day that I would turn it down — it is by far my favorite kind of cake. 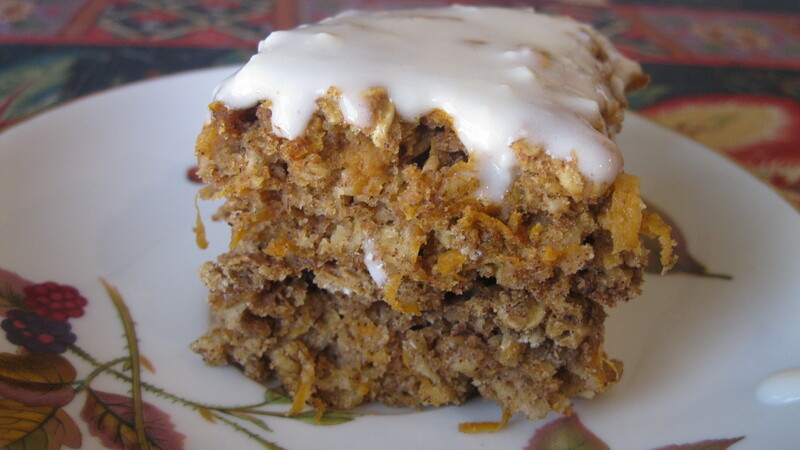 One of the great things about these carrot cake bars are that they are healthy enough to eat whenever and however many you want. These beauties are made with oatmeal, whole wheat flour, and obviously lots of shredded carrots — all making these practically a health food. I changed the original recipe quite substantially to include extra spices, maple syrup, and of course a lovely cream cheese glaze on top. Delicious. I made these on a whim while I was home over Spring Break and my family really loved them. We are no strangers to indulgence, but there’s certainly no harm in having something on the lighter side when it tastes as good as this. These bars are super moist and have great texture from the oatmeal. I left the cream cheese glaze separate from the bars so that each could be drizzled generously right before being eaten. There’s no reason not to make these as soon as possible. Healthy and delicious — can’t beat that! Beat sugar, maple syrup and margarine at medium speed of a mixer until well-blended (about 5 minutes). Add buttermilk, vanilla, and the egg; beat well. Lightly spoon flour into a dry measuring cup; level with a knife. Combine flour and next 8 ingredients (flour through salt); gradually add to sugar mixture, beating just until blended. Stir in carrot. Pour batter into an 8 x 8-inch baking dish coated with cooking spray. Bake at 350° for 33 minutes or until a wooden pick inserted in center comes out almost clean. Cool in pan on a wire rack. Place powdered sugar and cream cheese in a bowl; beat with a mixer at medium speed until well blended. Beat in 1/2 teaspoon vanilla. Slowly beat in milk until you reach the desired consistency.